To congratulate the happy couple on a special anniversary, send a gorgeous gift with this arrangement of roses, lilies, seasonal flowers, and more, in beautiful vase. The upgraded items contain more flowers in the style and color of the photo. so it is bigger and better. 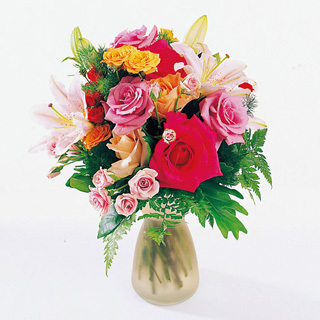 Three color of roses, lilies, spray roses, green foliage, glass vase and message card.